Pagani Automobili came in to being in 1992. Founded by Horacio Pagani, his aim was to build a car that was both a work of art and an engineering marvel. His first creation, the Zonda C12 was shown to the world at the 1999 Geneva Motor Show for the first time and its breathtaking lines and jewel-like interior were indeed comparable to a work of art. As for the engineering, that involved a modified Mercedes-Benz 6.0-liter V12 which produced 450 horsepower and 472 lb ft of torque, as well as one of the best exhaust sounds this side of a Porsche Carrera GT. Mated to a five-speed manual transmission it was capable of 185 mph and could hit 62 mph in just 4.2-seconds. Only five C12s were built, the one you see here is the very first example made, chassis 001. It was put to use as a test mule, covering thousands of miles and was even used for crash testing. Clearly, such a historically significant car deserved better than to be left to slowly rot away in a corner of the Pagani factory and to celebrate the 20th anniversary of its introduction, it has been fully restored in-house to as-new condition. Finished in its original Puro Silver paintwork, the first-ever Zonda still looks as stunning as it did when it was first unveiled. The gradual evolution of this basic design gave us ever more powerful variants with special editions and race-bred models culminating in cars like the intense 789 hp Zonda Revolucion and HP Barchetta. 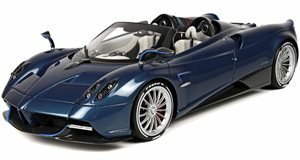 Were it not for the essential ‘rightness’ of the original C12, these models and the current-generation Huayra may never have existed at all. Fans of the Huayra will also be able to view the US-spec Huayra roadster at the Pagani stand too. It may be far more technologically advanced than that original Zonda but both share the common thread of engineering excellence combined with artistic design that sets these supercars apart from just about anything else.